Watch: Larry The Cat Goes Home And Brings A Bit Of A Brexit Breather A video of Larry waiting for a human to do his bidding, as he sits on the doorstep of No. 10 Downing St., has gone viral. Larry, the No. 10 Downing St. cat, photographed last year, brought some levity to a Brexit media report on Tuesday. It was a typical London scene at No. 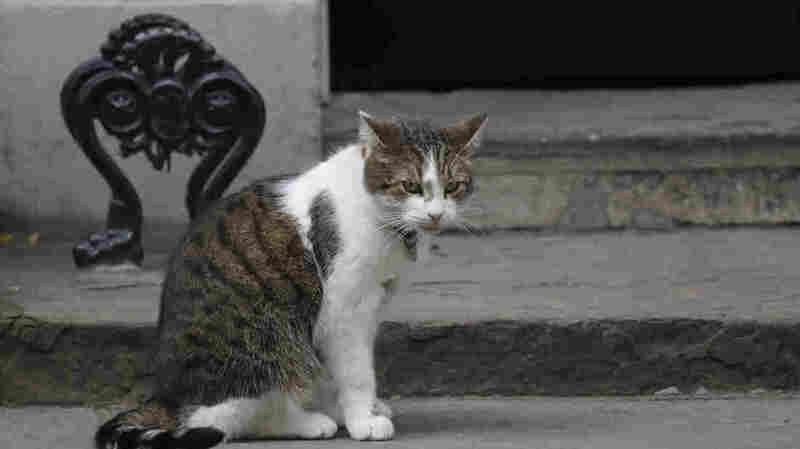 10 Downing St. on Tuesday: wet and gray, a television reporter wading into the seemingly bottomless bog that is Brexit, when in a flash there was the feline fix ushering in some much-needed levity. Larry the cat, who lives at and lords over the prime minister's residence, sat on the stoop, waiting for a human to do his bidding and let him in out of the damp. A police officer standing guard turned to look and with just a moment's hesitation, sprung into action and knocked on the door. It was the best he could do; No. 10 Downing St. has no external handle. Luckily, somebody on the other side was quick to open up and let Larry in. Tom Rayner, political correspondent for Sky News, carried on reporting about Theresa May's exit negotiations, none the wiser of the mini drama playing out over his shoulder. But the Internet was quick to pounce. Lauren Franklin, a writer, tweeted a video of the scene that had gained more than a million views before the day was through. She wrote, "Is there anything more British than this policeman knocking on Number 10 to let the cat in?" For Larry, a brown and white tabby believed to be about 12 years old, the surge in attention was just another Tuesday. Since 2011, the resident mouser has been steadily building a following, making frequent media cameos around what is arguably the most famous door in the world. And an unofficial Larry the Cat Twitter handle has more than 200,000 followers. A holdover from the administration of David Cameron, Larry was adopted from a rescue shelter and brought on board to address a rampant rodent problem at the British government headquarters. But Larry has displayed greater dexterity at entertaining the masses than at entrapping the mouses. Some of his other recent exploits include: staking out a turf war with a rival mouser, bouncing back after injuring his paw and going after a television reporter who displeased him. Meantime, despite his distaste for rain, Larry the cat will likely be withstanding the unforgiving winds of British politics, which have blown over lesser beings. "It's a civil servant's cat," an unnamed government spokesman told the BBC, when Theresa May took over in 2016. "(H)e will be staying."